1.PARIS.- Following in the footsteps of past exhibitions such as D'un regard l'Autre (2006) and Charles Ratton. L’invention des arts primitifs (2013), and ahead of the upcoming shows Picasso Primitif (2017) and Fénéon (2018), with Eclectic. A 21st Century Collection the musée du quai Branly - Jacques Chirac continues its examination of the history of art collecting, as well as the place of so-called ‘tribal’ art in the broader history of the arts. Perspectives on non-Western arts, and the way in which collectors approach them, have evolved constantly and considerably since the late 19th century. 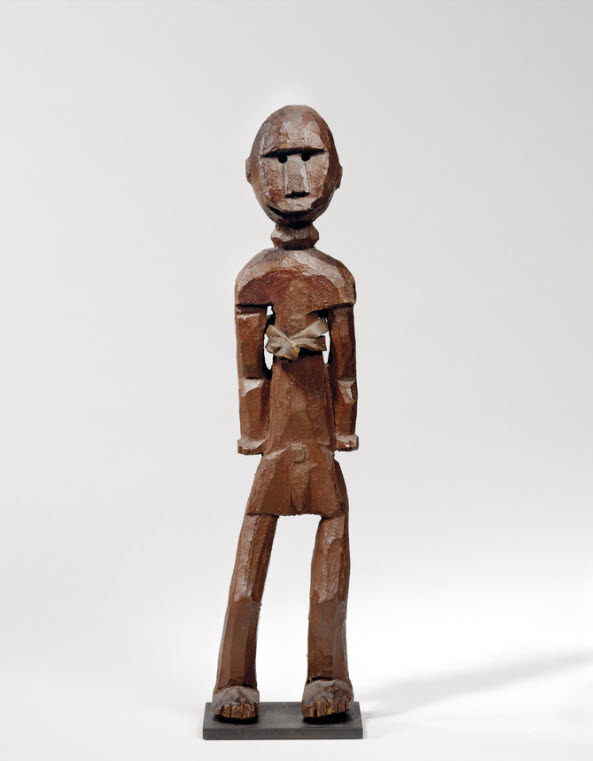 By presenting a selection of masterpieces from the collection of Marc Ladreit de Lacharrière, the musée du quai Branly - Jacques Chirac hopes to offer new insight into the mechanisms and motivations of 21st century art collectors, particularly concerning art from Africa and Oceania. An iconic modern collection, assembled in an age when non-Western arts have finally come to be considered on an equal footing with Western traditions, the items acquired by leading industrialist and philanthropist Marc Ladreit de Lacharrière constitute a sort of “ideal museum” reflecting the humanist worldview of this unusual collector, and his faith in universal harmony. Through a selection of sixty ancient, modern, contemporary and non-Western pieces of artwork – including 25 works considered masterpieces of African and Oceanian art – the exhibition aims to retrace the origins of the collection and the personal relationship between the collector and the works. The chronicle of a private passion, Eclectic. A 21st century collection is also a rare opportunity for the public to share in one of the great collections of the 21st century, discovering never-before-seen treasures of the kind which collectors rarely let out of their sight. Over the years, Marc Ladreit de Lacharrière has assembled a unique ensemble of works in his quest for the “ideal collection.” At first devoted primarily to classical and ancient art as well as modern and contemporary paintings, since 2003 the collection has been expanded with the addition of non-Western art, primarily works from sub-Saharan Africa, which have formed the basis of the collection over the past few years. This development from a focus on classical arts (Ancient Greece and Rome) towards so-called ‘tribal’ art is the fruit of chance encounters and lasting friendships with great connoisseurs such as fellow collector Jean-Paul Barbier-Mueller, as well as experts and advisors from museums, the Artistic Committee of France’s National Museums and fellow patrons of the arts. Ladreit de Lacharrière’s boundless curiosity is also informed by his belief in the importance of dialogue between cultures, a theme so close to the heart of his friend former President Jacques Chirac, and of course fundamental to the philosophy of the musée du quai Branly - Jacques Chirac. The development of this collection has been guided by Marc Ladreit de Lacharrière’s enthusiasm and eclectic interests which were shaped by old friendships and new passions, not all of which are covered in this exhibition: contemporary design, manuscripts and incunables, ivory sculptures (14th-19th centuries), modern and contemporary painting. This show at the Musée du quai Branly - Jacques Chirac is far from an exhaustive portrait of his catholic tastes and sensibilities. A relentlessly curious, sensitive collector, Marc Ladreit de la Lacharrière does not claim to offer definitive critical judgements on the works in his collection, preferring instead to surround himself with masterpieces with which he has a direct, emotional connection. His is a profoundly humanist view of the world. His artistic and philanthropic endeavours are united in this rich collection of Western and non-Western art, a paean to tolerance and understanding. As he has made his way in the world, Marc Ladreit de Lacharrière’s natural curiosity and open mind have helped him to slip free from the ‘mental straitjacket’ of Western-centric attitudes to art, embracing the universality of the artistic experience in human existence. He remains firmly convinced that art is not just a matter of aesthetics, but that one of the hallmarks of a great work of art, the source of its “human power,” is its ability to make us question our own certainties. The collection amassed by Marc Ladreit de Lacharrière is consistent with his approach to life, his sense of service and generosity and his belief in the importance of dialogue between different cultures. In his working environment, Marc Ladreit de Lacharrière likes to surround himself with carefully-selected, universal symbols which represent his philosophy and his commitment to tolerance and peace: a timeless, harmonious vision of human culture in which Africa has come to occupy a pre-eminent position. His home presents a more classic side of the collection, with paintings adorning the walls, but not without a scattering of African sculptures arranged with the sense of freedom so characteristic of this most original of collectors. 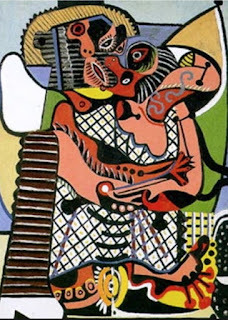 and Oceanian origin, along with a handful of historic and contemporary works of Western art. Upon entering the exhibition, visitors are welcomed by a Dogon sculpture of a Millet Grinder. 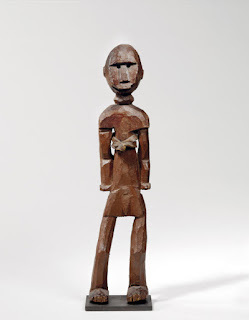 This exceptionally tall statue (100.5 cm), a masterpiece of Dogon art, is characteristic of the superb quality of the collection, and its owner’s taste for strong, elegant representations of women. With its intricate detail, stylised forms and subtle asymmetry, this statue embodies the exquisite refinement of African art. This section establishes a dialogue between significant works from Africa and Oceania and pieces from other fields and eras, playing on formal similarities and thematic echoes. Subtle interactions emerge between African masterpieces and ancient or classical sculptures: a plaque from Benin representing Oba Ohen (an 18th century king) sits side-by-side with a 2nd century bust of the Emperor Hadrian. A Dan crest mask from Ivory Coast, which once belonged to Paul Guillaume, presents a fascinating counterpoint to a Cycladic idol. The second section of the exhibition is a partial recreation of the way in which these works are arranged and displayed in Marc Ladreit de Lacharrière’s public and private spaces, giving us an insight into his approach to collecting and the way he relates to art. The works are displayed in modern, minimalist surroundings, with colours and furnishings which evoke the homes of the pioneering Parisian collectors of the 20th century. This section focuses on the African collection, which is the heart of the exhibition, and two fundamental aspects of human representation particularly prized by the collector: faces (masks) and bodies (statues), archetypes of African art as seen and framed by 20th-century collectors. This section illustrates the freedom with which Marc Ladreit de Lacharrière approaches the business of collecting art, with little interest in exhaustiveness or exemplarity. The route through the exhibition concludes with a Luluwa statue (Democratic Republic of the Congo) and a Luba arrow quiver (Democratic Republic of the Congo). These masterpieces bear echoes of the Dogon Millet Grinder sculpture which opens the exhibition, thus bringing the show to a neat conclusion. Marc Ladreit de Lacharrière is a French businessman. He was born in Nice and studied economics before attending the Ecole nationale d’administration (Robespierre Class). Marc Ladreit de Lacharrière served as managing director for several firms in the financial and industrial sectors – Banque Indosuez, L’Oréal – before founding Financière Marc Ladreit de Lacharrière (Fimalac) in 1991. Chairman of the Revue des Deux Mondes since 1990, in 2006 he founded the Culture & Diversité Foundation, a foundation dedicated to expanding access to culture and the arts for middle school pupils in underprivileged areas. Marc Ladreit de Lacharrière was made a member of the Académie des Beaux-arts in 2006, and has also won plaudits for his philanthropic work and valuable contributions to French museums. A great patron of the Musée du Louvre, he has been a member of the Artistic Committee of France’s National Museums since 1997, a member of the Societé des amis du Louvre since 2004, and Chairman of Agence France - Muséums since its inception in 2007, overseeing the creation of the new Louvre Abu Dhabi. He has been a UNESCO Ambassador for cultural diversity since 2008 and in the wake of the Arab Spring in 2011 he founded the l’Association des Musées Méconnus de la Méditerranée (AMMed), devoted to the promotion of neglected museums and cultural sites in order to encourage dialogue and closer connections between people on both sides of the Mediterranean. He has also served as President of the Association pour la Mise en Valeur de la Grotte ornée du Pont-d’Arc, dite Grotte Chauvet (Association for the development of the Decorated cave of the Pont-d’Arc, otherwise known as the Chauvet Cave) since its inception in 2010.